In a review I wrote a while back about a beautiful Samsung 55 inch TV, I took a moment out to whinge about its default ‘Sharpness’ setting for the picture. Out of the box, most of the settings produced a quite nice quality picture, except that it is all undone by the default ‘Sharpness’ control. 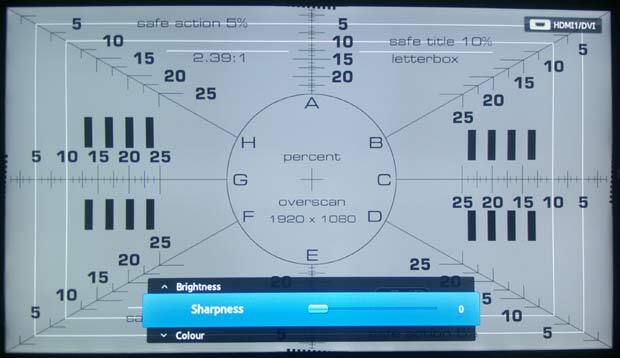 So what does a sharpness control do? And why was it wrecking the picture of this TV? This control does pretty much what its name suggests: it makes the picture look sharper than it actually is. 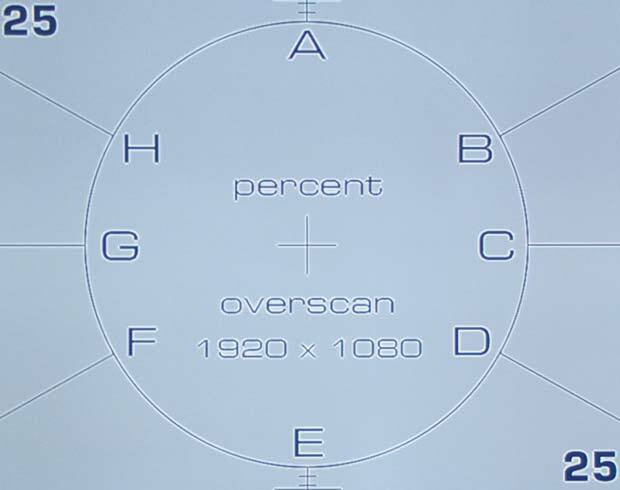 Hard edges on objects on the screen stand out more, as though the camera were more closely focused, or the picture was of higher resolution than it is. As you can see, it consists of sharply etched white and black elements on a mid-grey background (the picture didn’t scale down very cleanly, so the detail isn’t as clear as it might be). I photographed this pattern on the Samsung TV with its default picture settings. 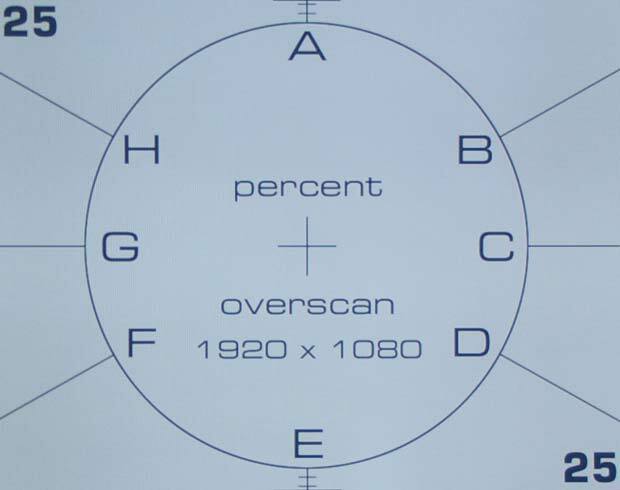 Here is the circle at the centre of the picture, photographed with the default ‘Sharpness’ setting of 50, on a scale of 0 to 100. Notice how the black text and lines all have this light grey, almost white-seeming, halo around them? As you can see, all those lines and text are now smooth and full, and free of those halos. The picture from the Blu-ray test disc is a full 1,920 by 1,080 pixels. It needs no sharpening. All that the alleged sharpening process does is distort it. On actual video material, those halos give the picture and edgy, harsh look and frequently obscure actual detail. I’m picking on Samsung here, but only because it was a Samsung TV on my test bench right when I was writing this. Many other brands also have the Sharpness kicked up by default, and they all do an equally poor job. There is a noticable boost in sharpness with this setting, and if you look carefully you can only just see light halos around the material. It is distorted, but with some content a small amount of distortion may be preferable to give a subjectively better sense with particular material. I’m a purist with my watching, in large part because that’s my job. But your system is, after all, for home entertainment, not home conformance-to-some-ideal. Second, with most TVs the ‘zero’ setting allows the original picture to come through unprocessed. Any positive setting applies the sharpness processing. But some brands actually have the real picture somewhere in the middle of their range, and reducing the setting below that actually softens or defocuses the picture. Just be a little careful that you don’t overdo it. Third, some TVs and displays have other settings with names like ‘Detail Enhancement’ which do similar things. If your picture seems edgy even with the Sharpness control turned down, explore the ‘Advanced’ picture menu to see if there’s a control like that. Finally, when you first turn down the sharpness control, the picture may well look soft to your eyes. You will be tempted to wind the control back up again. Do yourself a favour and just leave this artificial process off for an hour. If it still troubles you, then turn it back up. But it’s likely that you will very soon come to enjoy the increased amount of real detail now made available by the picture, along with its smoother more film-like quality. Notice how you can see all the detail missing from the ‘Sharpened’ version above? [A version of this was published in Sound and Image magazine in 2011]. 13 Responses to Sharpness? No. Distortion? Yes. This is an excelent illustration. I reduced the sharpness control of my KLV-40EX430 Sony LCD Tv to zero and I have come to enjoy the good pictures it presents. Thanks once again for the wonderfull article. Excellent comparison. Before I was quite ignorant of how to properly tune a TV. After turning the sharpness setting on my LCD down to 0, I can’t stand looking at someone else’s TV with a high sharpness setting. I can’t believe TV manufactures even allow the TVs to have such a high sharpness setting. It detracts so much from the original image, especially in today’s high definition world, sharpness is not needed. Once 4k becomes mainstream, I hope they get rid of the sharpness setting in all TVs. Tyler, I doubt it. Last year I went to the launch by a major TV brand of its 4K TVs, and it had them set to ‘Dynamic’ mode, which meant amongst other things a very high sharpness setting. The picture looked terrible, even with real 4K content. I prevailed on them to let me turn it down, and it looked glorious, but as soon as I handed back the control, they put it up on high sharpness again. I have a samsung 2007, 67 in. tv, can the pixel quality be increased in it, by maybe replacing a chip of some sort in it.? thanks. I just bought a 55″ TCL flatscreen and while it is a “budget” set, I was quite unimpressed and disappointed with the picture quality. I’ve been playing with settings for a while now and was about to just give up and accept that it’s a cheapish tv ($800~) and i’ll get used to the below par quality. Then I figured it couldn’t hurt to have a look online and see if I can find “fixes” and tips to improve it even just a little. I found this page and I remembered seeing the sharpness dial when I was messing around with the settings, so I turned it right down and WOW, what a difference. It’s still not crystal clear and I don’t expect it to be, but this is amazing compared to what it was. So thank you! Glad to be of help Ash. I have a Sam 51 e450 (1024:768 resolution) plasma.If you put sharpness below 25 then the tv is blurry crap. I’m still a little confused. My LED TV’s sharpness control actually goes lower than zero; into the negative numbers. Should I stay at zero or should I go lower than that? That’s an unusual scale. In general, the numbers on the scale are meaningless, but yours might imply that zero is the best setting. You will just need to experiment a little. Find a disc with a menu, or a scene you can pause on, which shows black lines against a grey background and use the pictures in this post as a guide to adjustment. The main thing is to avoid that kind of halo effect. 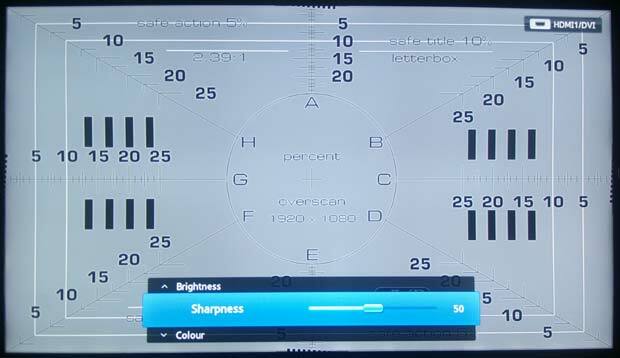 I watched unnecessarily grubby looking pictures on my Sony LCD TV because I assumed that the default midway setting for the Sharpness control was its neutral setting. I eventually realized that the minimum setting was close to neutral. I recently asked Panasonic to tell me what the neutral Sharpness setting is on one of their current models is. The response I received was not useful. TV makers need to relabel it as “Grubbiness control” so that users will better understand its real function.